Have you heard? I’m sure you have. Starting about 6 weeks before Matthew was born, Adam decided he needed to lose some weight and get healthy. As part of the changes he made, he took up running and started couch to 5K. He’s been going strong and getting faster ever since. In September, my post baby weight-loss was slowing down a little bit and I wasn’t thrilled about that so I started walking to help boast my calorie expenditure each day. I worked into running more slowly than Adam did, but I also started couch to 5K, and ran my very first 5K (not race, just distance) on my 29th birthday. 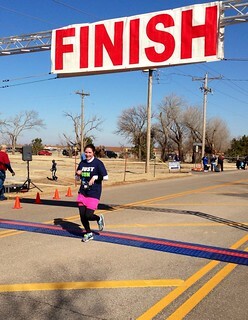 Feeling pretty awesome about that, I saw there was a 5K race on January 1, 2013 and I wanted to do it. 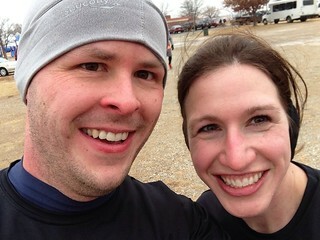 I asked Adam if he would do it with me, and we ran our very first race together and ever on January 1, 2013 in 29 degree weather with freezing Oklahoma wind. Not long after that I wanted to run another race and both Adam and I signed up to run the Creek Classic 10K race. Adam was already at a place where he could go out and do that, but I had to train for it. And train I did. I developed trocanteric bursitis (basically a continually sore hip joint that got better with rest, but flared back up after a run), and we went on a cruise. Even on our cruise, we ran on both sea days at least 3 miles. 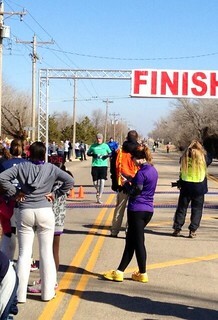 After the 10K, I was put on a week of rest along with an ibuprofen regimen to help the swelling in my hip go down. I’ve since gotten sick and had to take another week of rest after only 4 runs back from my rest. I’m back on it next week though. Not long after signing up for the Creek Classic, Adam signed up to run a half Marathon at the Oklahoma City Memorial Marathon on April 28th. He’s been training hard, and he got sick too. It really didn’t help either of us. I’m excited to go to the race to support him. He’s gonna do great!